Working from home has its perks. But it can be pretty isolating when your desk is only a few feet away from your bed. One solution is to set up shop in a café around the corner. If that’s something for you, here are a few of Edinburgh’s best work-friendly cafés for small businesses. Why working from a café? When I was still working from home, I loved surrounding myself with people every now and then. And even better: I still got lots of work done and felt less lonely. Networking events can only get you so far. A local café is also a great place to meet clients or work with other freelancers on joint projects. And Edinburgh has a lot to offer when it comes to working remotely. And here’s a list of Edinburgh’s best work-friendly cafés to get you started on your journey of remote working. All thoroughly tested by me, of course! This is a unique space when it comes to Edinburgh’s best work-friendly cafés: Levels Café & Lounge is part of Edinburgh University but is open to everyone. They have several different areas: You can, for example, sit on a stool by the front window, lounge on their sofas and armchairs in the back or work on one of the many comfortable tables in the centre of the café. They even have three work desks complete with desk lamp and extra sockets! The wifi is free, fast and has so far worked flawlessly. Additionally, they have a good selection of locally sourced and seasonal food, drinks and fair trade coffee. Find more work-friendly cafés in Edinburgh for small businesses. I’ve recently discovered a new café in the Abbeyhill/London Road area: The Red Kite Café. Apart from their amazing coffee and tea collection, it’s a great place for lunch, some cake – and work. They have stools by the window, large and smaller tables and the free wifi works well. It’s a lovely bright space and so far it has never been too busy to work. Somehow they managed to create a large space that feels cosy without feeling cramped. And their homepage gives me website envy (but that’s for another day ;) ). Definitely one of my favourites among Edinburgh’s best work-friendly cafés! 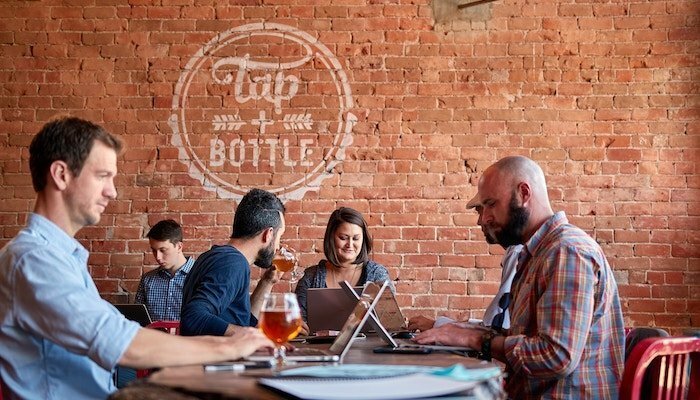 Another great place to work from is Brew Lab. Especially if you get there before lunchtime you have the choice between stools, large or smaller tables either by the window or in the back. They have some extra sockets throughout the place, free wifi and a very nice vibe. If you like coffee, you’ll love Brew Lab but they also offer really nice teas for the non-caffeine faction. And their pastries, soups and baguettes are great, too. With its four different areas, there’s plenty of room although it might get a bit noisy around lunch time. If you need cake to boost your workday, then you should consider working from Lovecrumbs. It’s a lovely little place in West Port with comfy seating. With it being so close to uni and the Old Town, it can get quite busy but mornings are usually a good shout. August_21 is a little café, tucked away in the Southside of Edinburgh. It’s not very big but at off-peak times it’s not a problem to get a seat. They have free wifi, extra sockets and the food is awesome: pastries, baguettes, soups and other fresh dishes – there’s something for everyone. Their drinks selection is great, too, but most of all it seems to be the staff that makes this place: They’re super friendly and certainly adding to the nice vibe of the café itself.